Phoenix Nest, our romantic and spectacular oceanfront vacation home, is nestled on two glorious acres of forest right on the ocean. 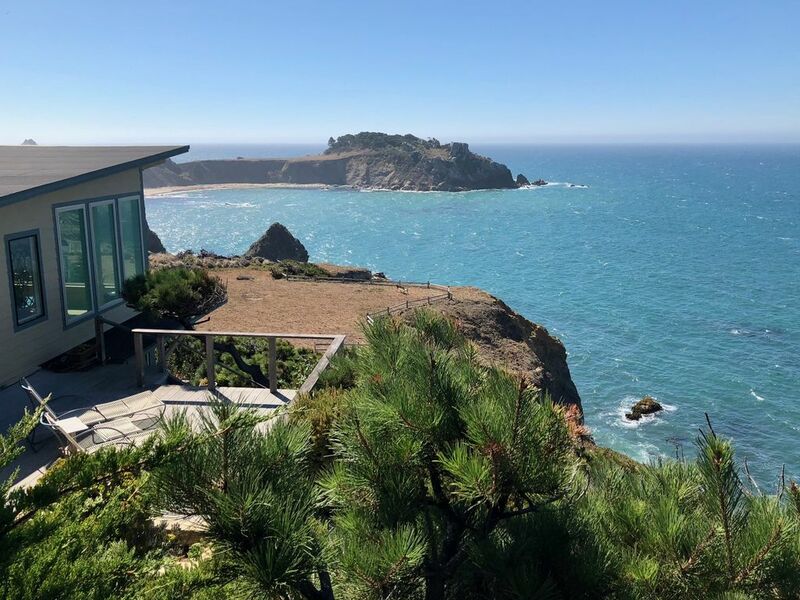 The 2500 square foot, newly remodeled home is bright and airy and includes a 44-foot living room with windows throughout overlooking the ocean. The two master bedroom suites also have unsurpassed, sweeping views of the ocean. The house has great privacy. You can hear the waves crash and see the osprey and gulls fly by as the low tide unveils the rocks and sandy beach. Watch gorgeous sunsets from the deck or hot tub. You will see sea lions surfing or resting on the rocks on the Havens Neck peninsula. We often see gray and humpback whales and recently blue whales spouting and occasionally breaching out of the ocean. The bluff is like a garden, covered with plants and natural wildflowers. Known as the 'banana belt,' nearby rivers provide a more fog-free and temperate climate than other coastal areas. We were greeted by deer and the gentle barking 'hellos' of the sea lions. The house is so comfortable--more space than we imagined and the light so wonderful.. The view rates in our top three--following the Grand Canyon, Positano, Italy and tied with Villa Cinciano in Tuscany. As we say farewell to the deer and sea lions, we'll promise to return and will always remember the beauty by day and the peaceful blanket of the Milky Way by night. Thank you for sharing your spectacular home with us. toilet, shower, This is the upstairs bathroom. You are right on the ocean cliff with 180 degree view of the ocean north and south. This is for local calls only. We recommend that you bring a phone card for long-distance calls. The only cell phone carrier that gets slight reception is Verizon currently. The energy efficient wood-burning stove is located in the living room. The living room is 44 feet long and has several comfortable seating areas with windows on the ocean from each area. Dine while watching the whales swim by. We have a few DVDs and videos for guests to use. There are kayaks to rent in Gualala. Overlooking the ocean with deck chairs and picnic table and Weber charcoal bbq. The upper driveway has a fully accessible path with a ramp into the upstairs. The shower is roll-in. Hot tub overlooking the ocean. Accommodates 4 people. You will not find a more awe-inspiring 180-degree view of the ocean and coast from any other home. Our kitchen is fully equipped with every gadget imaginable, a Cuisinart Coffeemaker, a Bialetti espresso maker, coffee grinder, waffle maker, blender, lots of pots pans and attractive dishware. Other Activities: You can often see gray whales migrating south in winter and north in spring with their calves. Rates are more for 3-4 guests. $345/night; $795/weekend; $2,250/week Cleaning fee is $125 for two guests. $150 for 3-4 guests. We charge you for the weekend rate if you choose arrival on Saturday and departure on Monday.